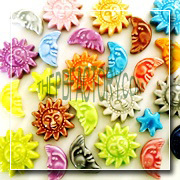 The Peruvian Bead Factory showcases a vast array of solid color shaped beads that are great fun to work with. 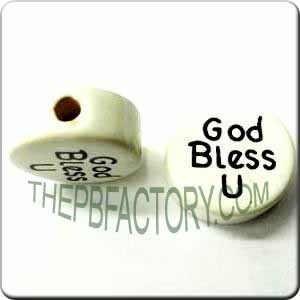 They are hand painted in an assortment of single-tone solid colors which lends the beads their name! They can be used to make attractive beading projects as well as funky jewelry, especially earrings and bracelets. A funky dolphin dangling from your ear or a string of pigs, puppies and owls adorning your wrist is bound to bring out the ecstatic child inside you! The solid color shaped beads are available in different shapes like fruits, vegetables, marine life and land animals, sun, moon, stars, etc. There are a variety of fish shapes in varying sizes and colors, with holes drilled through the side either vertically or horizontally. 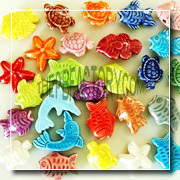 The rich detail of animal shapes like dolphin, sea turtle, owl, puppy, pig and elephant shapes are particularly eye-catching. 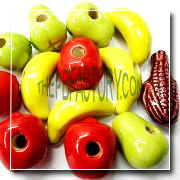 The fruits category has delectable beads in apple, pear, banana and corn shapes glazed in a single color without any variations or detailing. 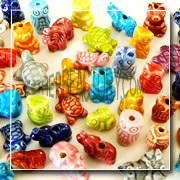 All solid color shaped beads are sold in sets of 25 pieces with most of them having 5 units each of 5 dazzling colors. You can mix and match any of the adorable motifs to match/contrast your outfit or stick to a more thematic arrangement of similar shapes that catch your fancy. The result will be a statement piece to behold!